We have been advised to check the 24-hour PSI. At times, the 1-hour PSI is more than 100 points higher than the 24-hour PSI. Clearly, when the pollutant concentration is changing rapidly, what matters most to most people is the latest pollutant concentration reading (in this case, the 1-hour PM2.5 and its derivative 1-hour PSI) if they are outdoors. It doesn't really matter to them what the average pollutant concentration has been in the preceding 24 hours, just as when a person is unwell, what matters is his temperature now, not the average over the past 24 hours. 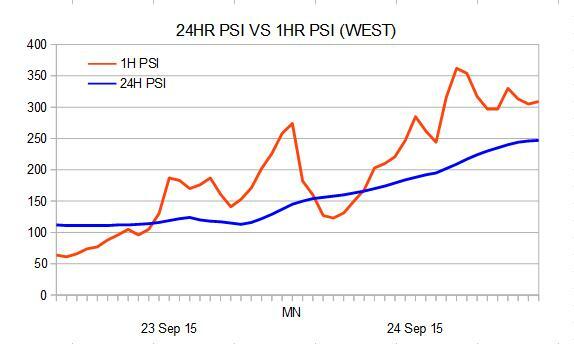 So why is there a 24-hour PSI? There is a health advisory that has been developed based on observations of communities that have been subjected to prolonged (natural) exposure to pollutants at concentrations that as nearly as possible do not vary significantly whether on an hourly or a daily basis. Thus, according to the health advisory, a 24-hour PSI not exceeding 50 is considered to be healthy, a 24-hour PSI between 51 and 100 is considered to be moderate, etc. There is, however, no health advisory corresponding to the 1-hour PSI or 1-hour PM2.5 or even the 3-hour PSI because no one knows, nor can anyone observe, the effects of a short-duration exposure to a 1-hour PSI or a 3-hour PSI of, for example, 350. 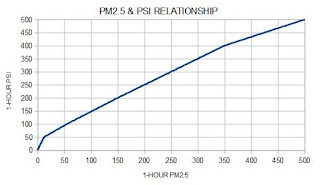 Over an extended period of time, exposure to a 3-hour PSI of, for example, 150 converges to an extended exposure to a 24-hour PSI of 150. What then, about the 24-hour PSI and the 3-hour PSI? The usefulness of the 24-hour PSI is limited when the pollutant concentration fluctuates throughout the day. As for the 3-hour PSI, it's quite useless because it averages the pollutant concentrations over the five regions in the past three hours. What most people want to know is how polluted the air is at a particular location, and real time too. A case in point regarding the divergent inference from the three pollution measures is illustrated by the situation at noon today (25 September 2015) after PM2.5 concentration fell sharply in the preceding two to three hours. The 24-hour PSI in the west was 306, in the hazardous range. The 3-hour PSI was 126. The 1-hour PM2.5 in the west was 33 μg/m3, corresponding to a 1-hour PSI of 74. It's clear which air pollution measure provided the most relevant guidance for outdoor activity at that time. 1. Understanding Pollutant Standards Index And Air Quality 13 Oct 2014. 2. Pollutant Standards Index - Fact, Opinions and Dangerous Misperceptions 27 Jun 2013.